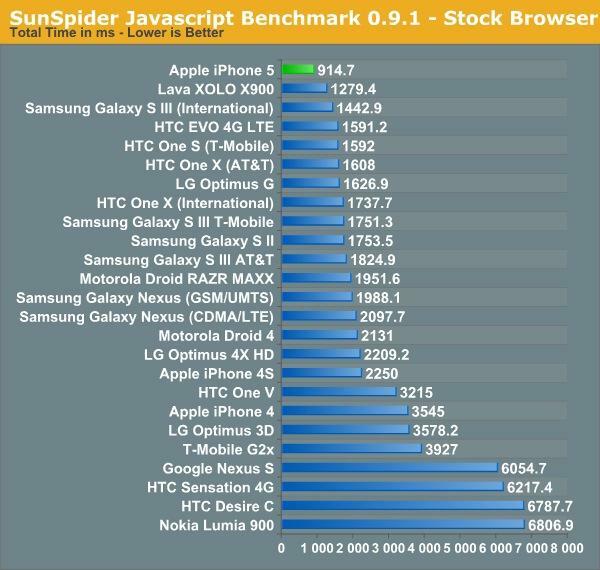 While not an official test, AnandTech was able to run SunSpider v0.9.1 on an iPhone 5 review sample on Wednesday, and watched as the dual-core A6 chip chewed through the benchmark in 914.7 milliseconds, outpacing the second place Lava XOLO X900's time of 1279.4 milliseconds. The Lava XOLO runs a single-core Intel Atom Z2460 Penwell SoC built on the chip maker's Medfield platform. As noted by the publication, SunSpider is slowly becoming outdated as a smartphone benchmark, however it highlights issues pertaining to ARM's Cortex A9 memory interface. "Intel originally hinted at issues in the A9's memory interface as being why Atom was able to so easily outperform other ARM based SoCs in SunSpider," reports Anand Shimpi. In a Monday report, online benchmarking site Geekbench reportedly logged an iPhone 5's performance data, outing the specifications of the handset's A6 chip. At the time, it was thought that Apple made dramatic improvements to the standard ARM core's memory interface as the Geekbench data suggested a drastic improvement from previous Cortex A9 chips. Although it hasn't yet been confirmed, the A6 chip is reportedly Apple's first attempt at designing an ARM core in-house.